The Cashier’s House, a three-structure Greek Revival style complex, was built in 1839 by Philadelphia architect William Kelly. Connected to the Cashier’s House as part of this complex was the Carriage House and the Old Custom House, symbolizing the mid-nineteenth century hopes for the future of the emerging business district and the nation itself. In the eyes of Erie’s residents, the construction of the Erie Extension Canal that would connect the City of Erie with the Ohio River could only lead to abundance and growth. 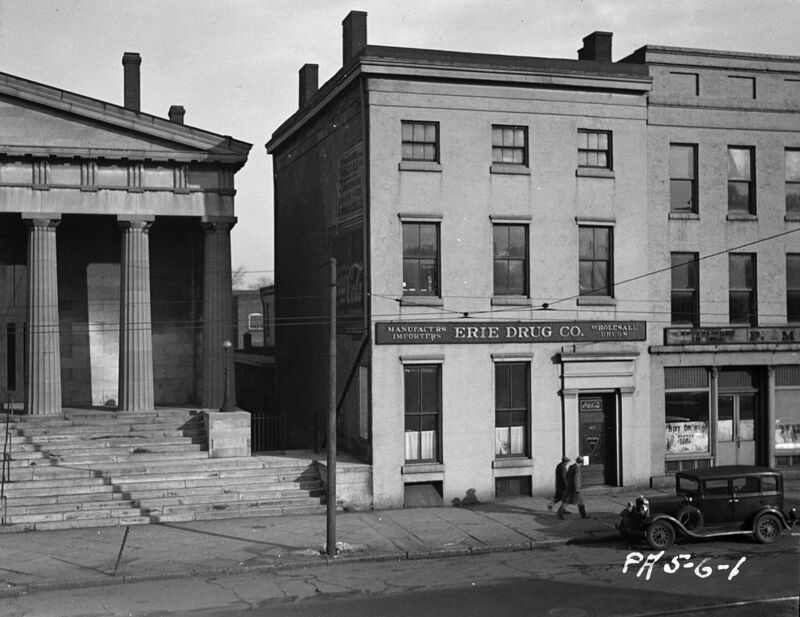 The Erie branch of the United States Bank of Pennsylvania, for which the Cashier’s House was built, pointed towards Erie’s prosperous future. Built for the bank’s first and only Cashier, Peter Benson, the Cashier’s House and Carriage House would only be used by the bank for four years. The U.S. Bank of Pennsylvania, and subsequently its branches, closed in the early 1840s. The Erie branch opened in 1839 and eventually succumbed in 1843. After this, the Cashier’s House, and its connecting Carraige House, went through a succession of owners. Peter Benson remained in the house from 1839 until the bank closed in 1843. The Cashier’s House was then used as a girls’ finishing school operated by Louise and Calista Ingersoll. In 1853, the property was briefly used as a bank until 1858 when it was converted to a boarding house. In 1872, the Cashier’s House was sold to Attorney Samuel Woodruff of Girard, who owned the home until 1913. The Carriage House was sold to Edward Pelten, who used the building as a marble shop until his death in 1904. It was then sold to Robert H. Chinnock, a blacksmith who expanded the structure to house heavy equipment and machinery. During this time, the Cashier’s House was being used by Ashby Printing Company. After the company closed in 1924, the Erie Drug Company moved into the space, remaining there until 1963. The Pennsylvania Historical Museum Commission purchased the home in that same year, completing an eleven-year restoration project that made the home appear as it did in 1839. The Cashier’s House and Carriage House were listed on the National Register of Historic Places in 1972, and the Historical Society of Erie County acquired the property in 1974. The house was refurnished and used as a museum, and eventually as storage for the Historical Society’s expansive collections. On March 12, 2013, the Pennsylvania Historical & Museum Commission transferred custody of the Cashier’s House to the Erie Art Museum.